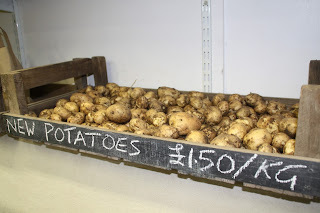 New potatoes - the end of hungry gap? 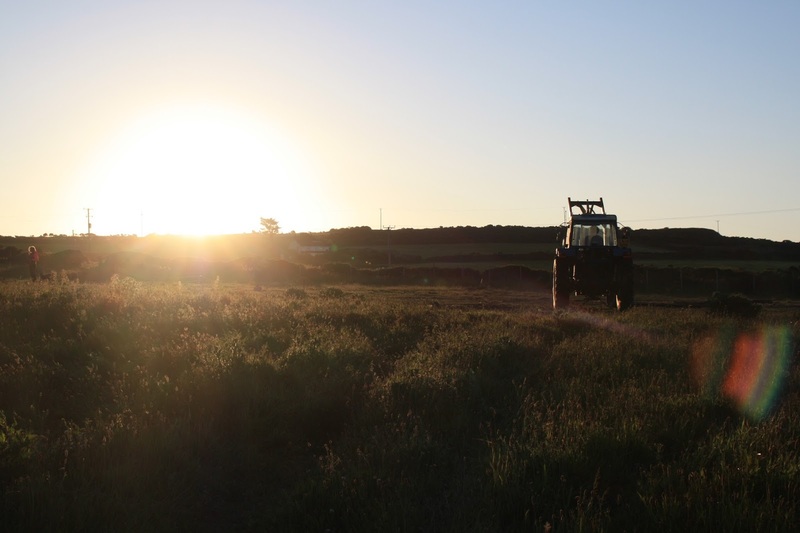 Last week we began to harvest our new potatoes (Maris Peer), which are heavenly! 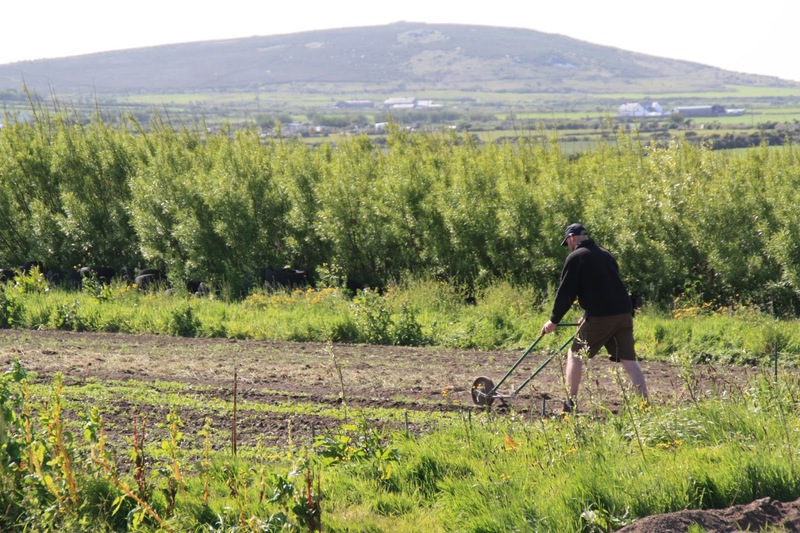 We are digging them by hand most days of the week, and they are proving very popular in our shop and markets and veg boxes, and also with local restaurants and pubs. 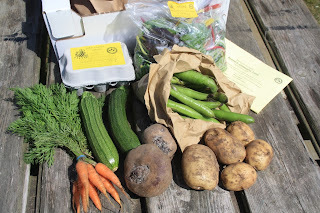 Yesterday's small £6 veg box with optional extra eggs. 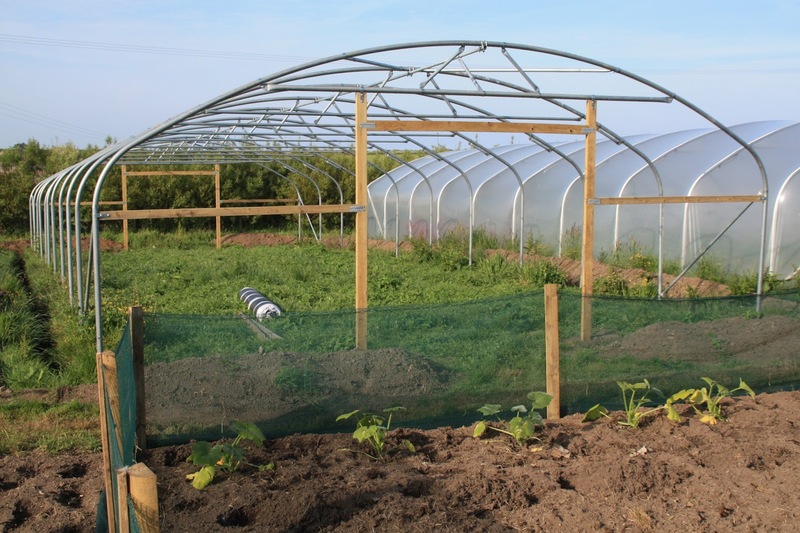 Yesterday's small veg box contained a small bunch of this year's first baby carrots, 2 courgettes grown organically on a local farm (the only item not grown on the community farm), 500g of beetroot, 1kg of new potatoes, 400g of broad beans, and 200g of new season rainbow chard. The standard £10 veg box also included a bag of salad leaves and flowers, the first of this year's cucumbers, plus extra new potatoes, courgettes and beetroot. 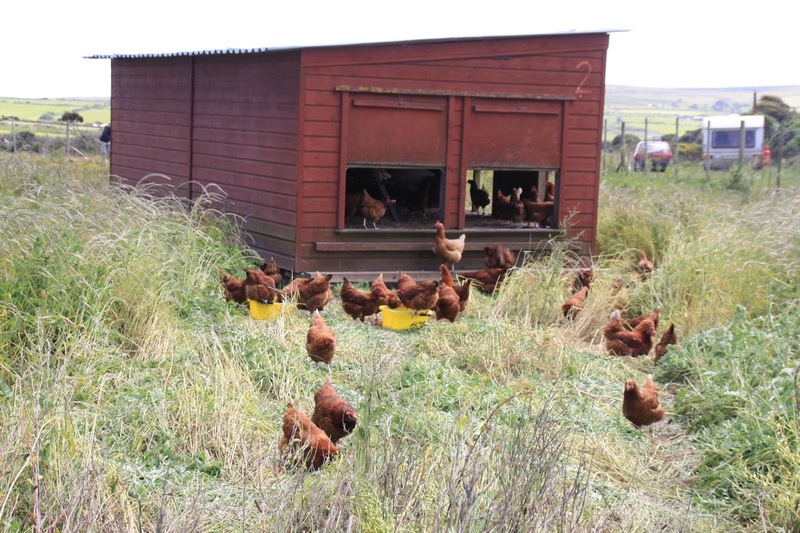 Eggs are an optional extra, as are bread (organic from Helston), milk (organic from Treen), honey (from our own bees) and raw chocolate (hand made in St Just). 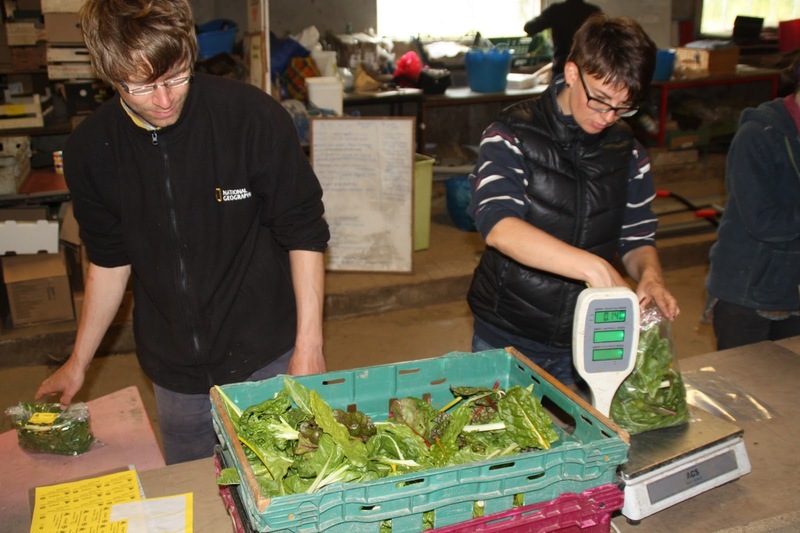 Please phone the farmhouse on 788454 if you would like to join our veg box scheme. Digging over and planting our seventh polytunnel. 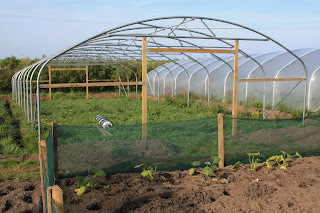 After finally being able to cover the tunnel on Tuesday 16th, we spent all our spare time for a week digging it over to remove weeds and produce a good tilth (aided by having rotovated this area several times in the previous 12 months), until on Wednesday 24th it was ready for irrigation to be set up and planted fully with tomato plants. 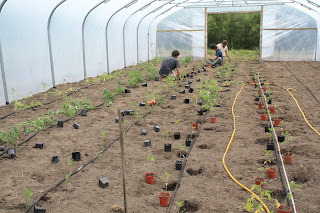 They have gone into the ground several weeks later than ideal, but some plants already have green tomatoes on them, plus we have 50 early plants in the Mothership polytunnel to give us a July harvest. 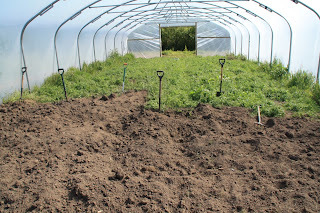 After the first session of digging over the tunnel. 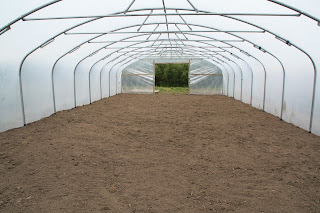 Tuesday afternoon, and the tunnel fully dug and levelled. 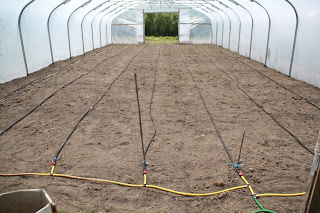 Wednesday morning, and the irrigation is installed (made of recycled car tyres and reclaimed hosepipe). 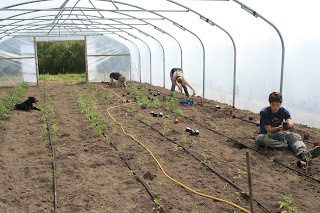 Planting the first line of tomatoes, with Iris and Max, and Pete fitting the doors. 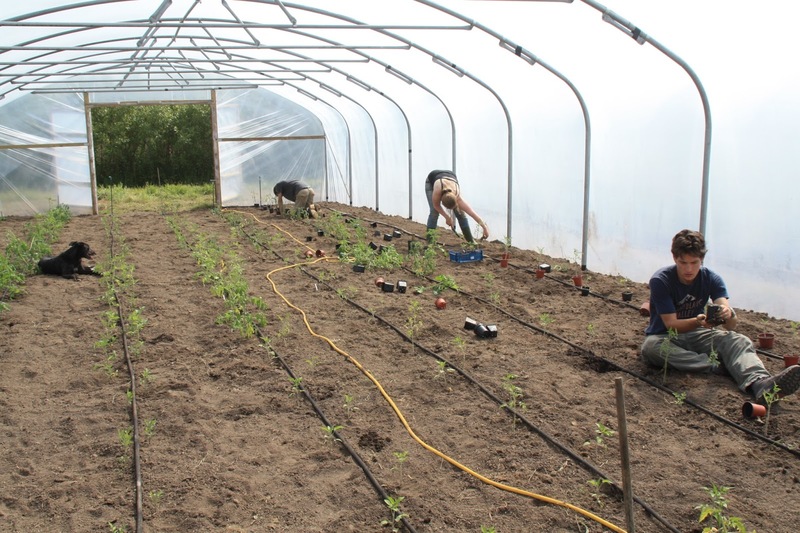 Half the lines planted, with Max, Pablo and Pete. 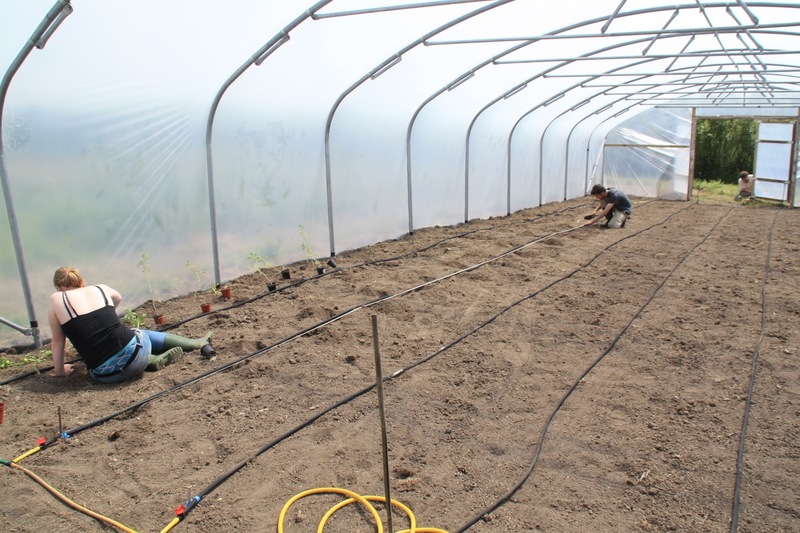 Wednesday afternoon, and planting the final line, with Tigerlily, Max, Iris and Pablo. The tunnel is now filled with 294 tomato vines, of 13 different varieties, from cherries to beefsteaks, and several different colours for maximum diversity. Better late than never! 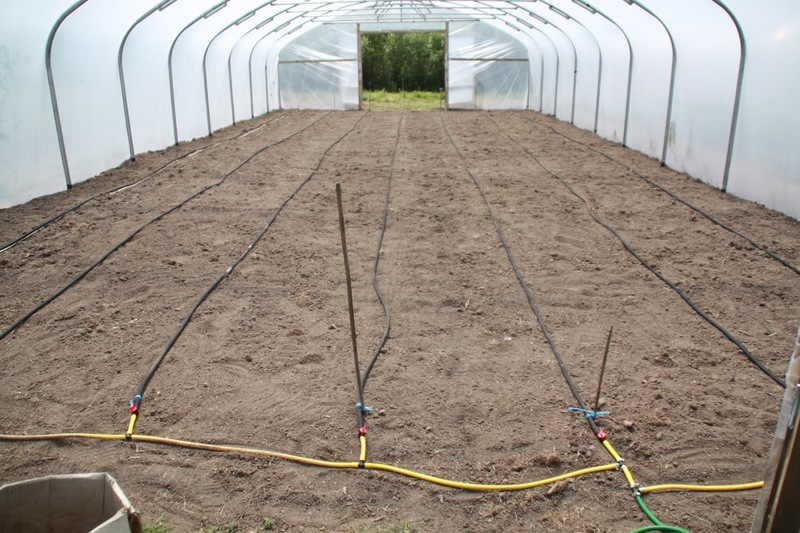 And now to string them all up and do the first side-shooting (but first we need to plant out all those squash plants...). After three weeks of waiting, the wind died down enough for us to put the skin on our seventh and final polytunnel! 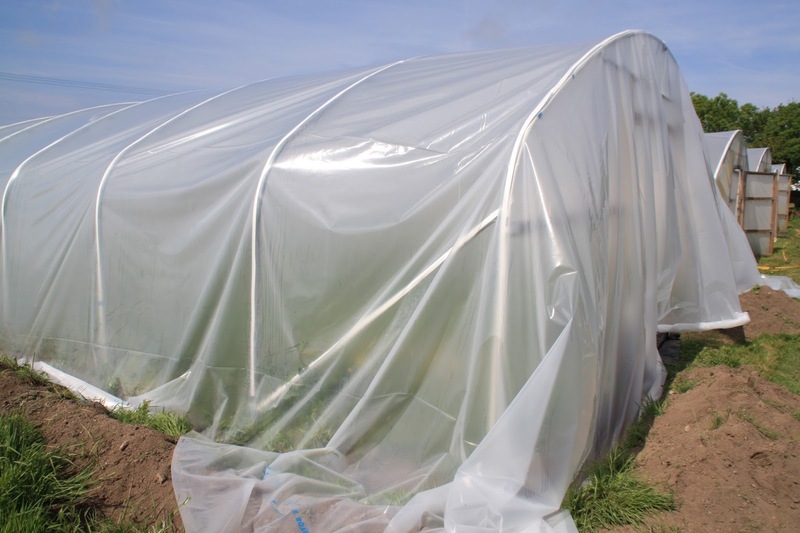 This will house the bulk of this year's tomato crop, though 50 plants are already fruiting in a small area in the Mothership. The polytunnel frame at 8am today, ready to start work. Having stuck anti-hot-spot tape over the frame, and unrolled the plastic along the side, two of us climb into the rafters to help pull the skin over the frame. 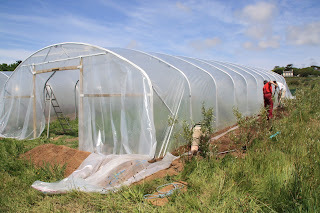 The plastic skin on the frame and partially secured - time for a morning tea break. Filling the trenches to hold the plastic in place, and cutting the door-holes. 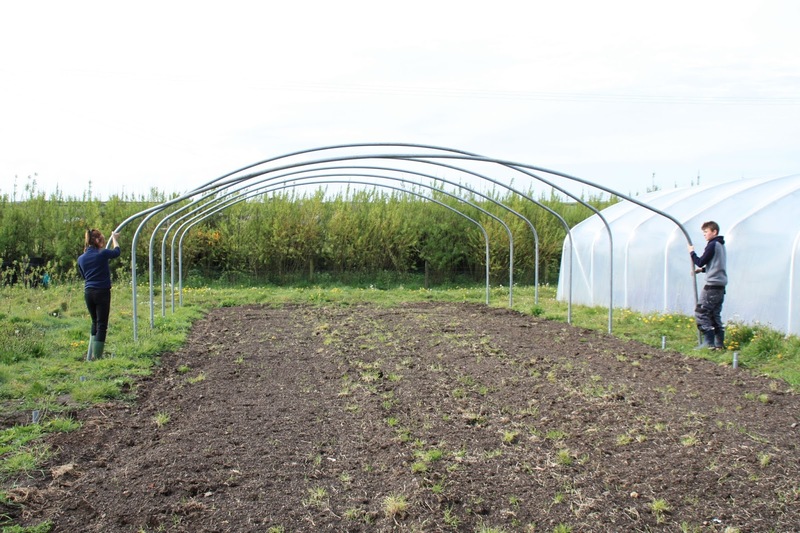 The doorways battened and tidied - just the doors to hang and the weeding to do (tomorrow...). 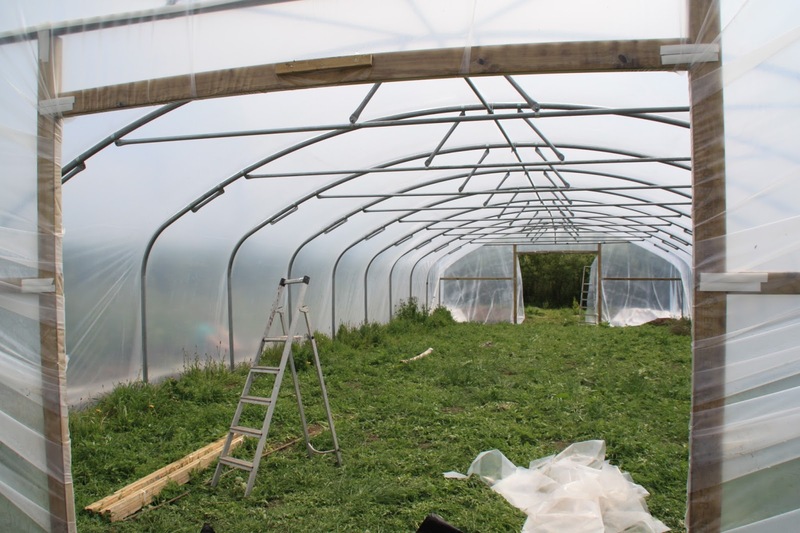 We'd like to thank the people who volunteered their time to help us skin the polytunnel - Alice, Andrew, Claudio, Iris, Jenny, Kieron, Maxime and Sue. 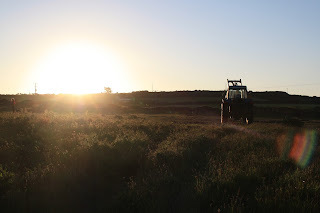 Three of our wwoofers (from Holland and Germany) left the farm today, to continue their travels around the UK, and we would like to thank them for being part of the farm community for a short while, and wish them well for their onward journeys. Annette weighing herbs in the packing shed. 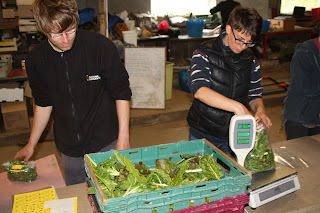 Kamala (on the right) packing chard with Gregor. 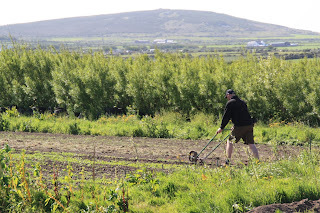 Seb wheel-hoeing between parsnip seedlings in the market garden. Tomorrow still looks set to be good weather for skinning our polytunnel, so we are going ahead. 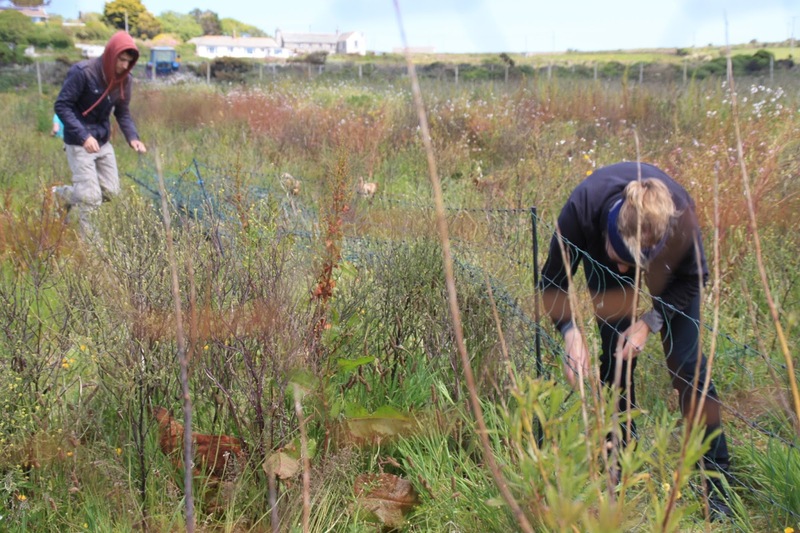 If anybody wants to help us please be at the farm by 9am - we would love to see you! 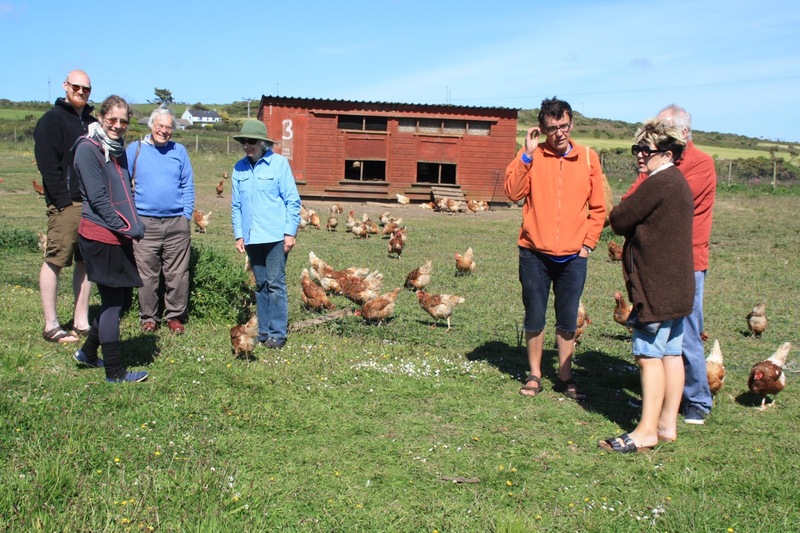 Gregor, from Rostock in Germany, is leaving the farm today after three weeks volunteering as a WWOOFer, and we'd like to thank him for his help and humour and bread-baking over this time. 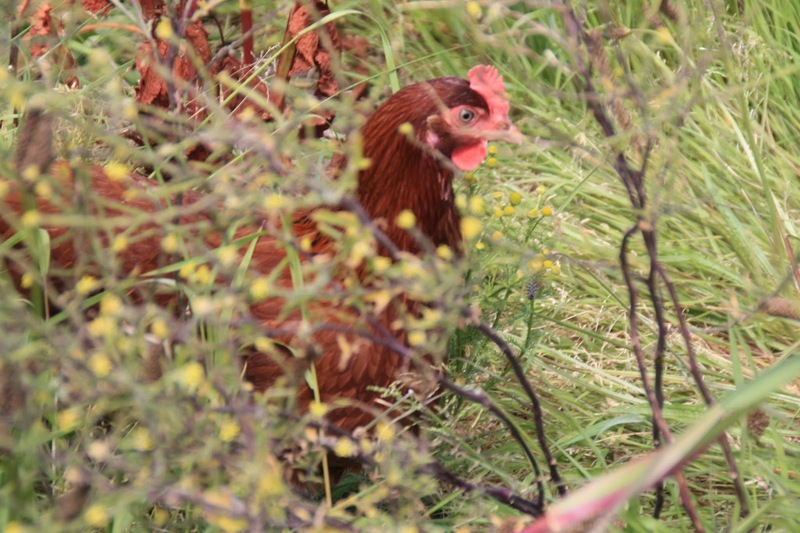 Gregor is the second friend of one of our first ever wwoofers to come to the farm on her recommendation - thanks for sending your friends our way! 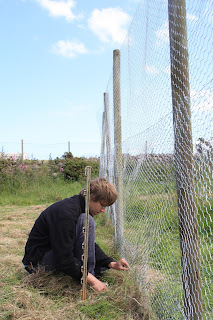 Gregor repairing fencing during the chicken move. 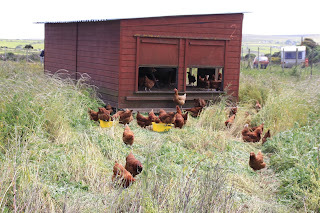 Moving our chickens and sheds. 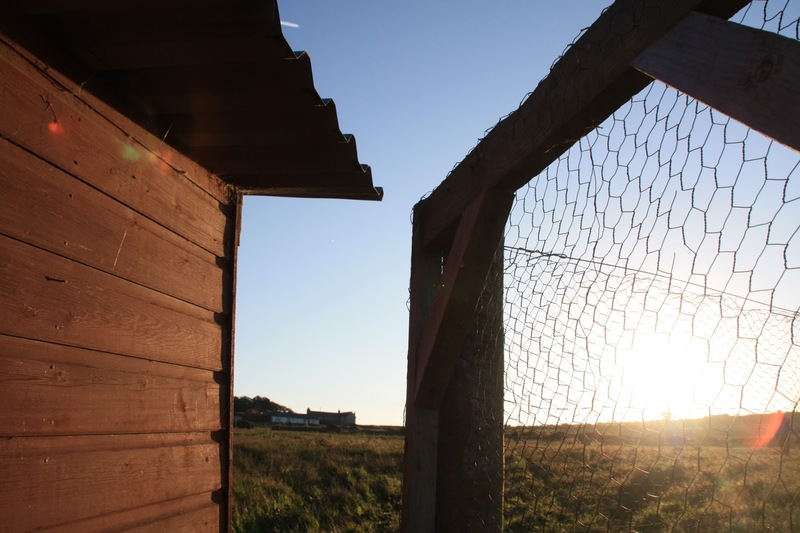 Every two years, as part of our rotation, we move the chickens and their sheds from one field to another (we also rotate them around each field as often as possible, usually every six months). 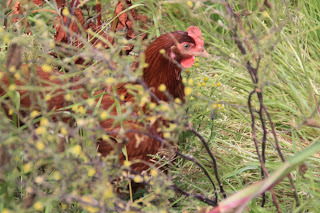 This means that we can utilize their fertility (manure) to grow two years of crops - and also that the chickens can then pick through the remains of last years crops (in this case leeks, carrots, beetroot, radishes and potatoes) plus green manures. Our new yoke attached to the tractor. 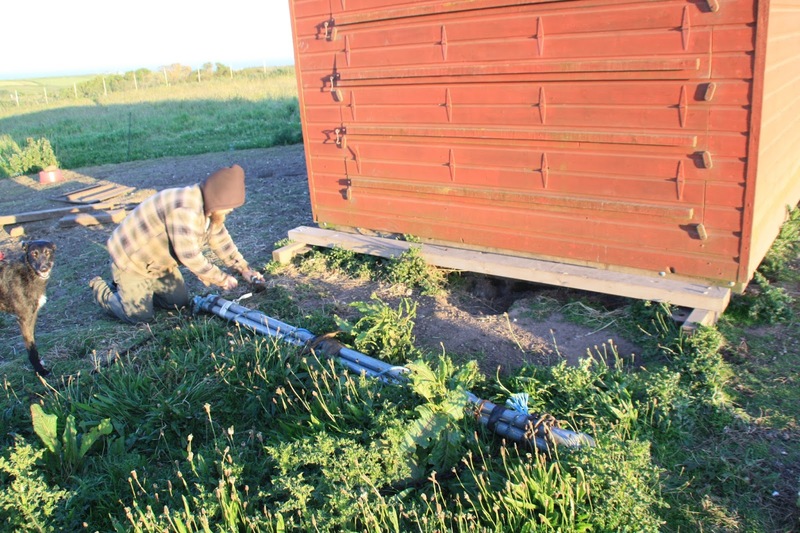 Pete and Tigerlily attaching the yoke to a shed. 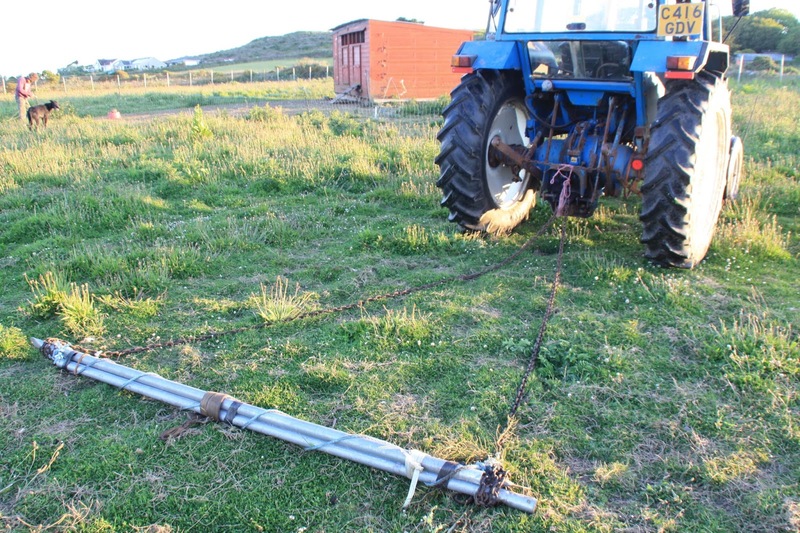 Having spent a lot of time and money repairing the skids on the chicken sheds last August, this year we built a yoke by lashing together three sections of old polytunnel tubing, allowing us to pull the sheds without straining the new timbers as much as before. Sunrise in the old chicken field, as we prepare to drag the second shed. 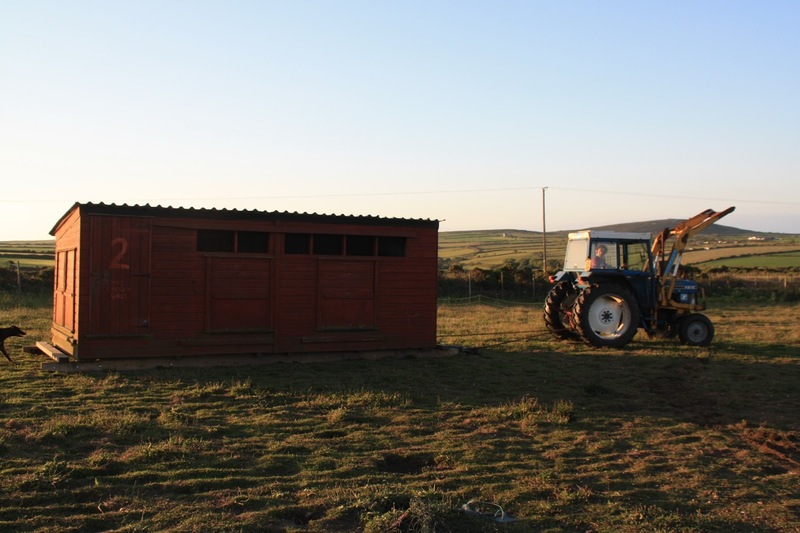 Shed 2 heading across the field. 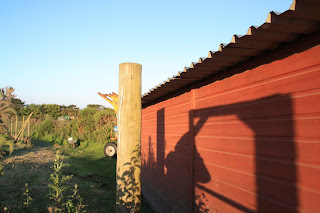 Squeezing through the first gateway, with 60cm to spare on either side of the shed. Squeezing through the second gateway and heading for the third. 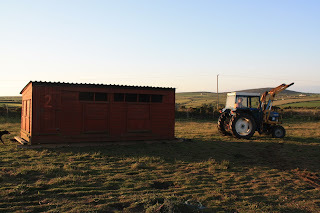 Thanks to our new tractor (purchased last year) we were able to drag the sheds from one field to another by ourselves for the first time, allowing us to start at 5am so as not to disrupt the chicken's daily routine too much (we usually feed them and let them out at 7:30am). We had all the sheds in their new locations at 6:15am, then spent 2 hours re-building the fence before being able to let the birds out. 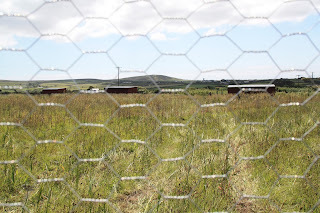 Most of the rest of the day (Wednesday 10th) was taken up in installing electric fencing and chicken mesh, as well as water butts and drinkers etc..
All three chicken sheds behind the newly repaired fence. Max and Annette installing intermediate fencing between the chicken sheds. 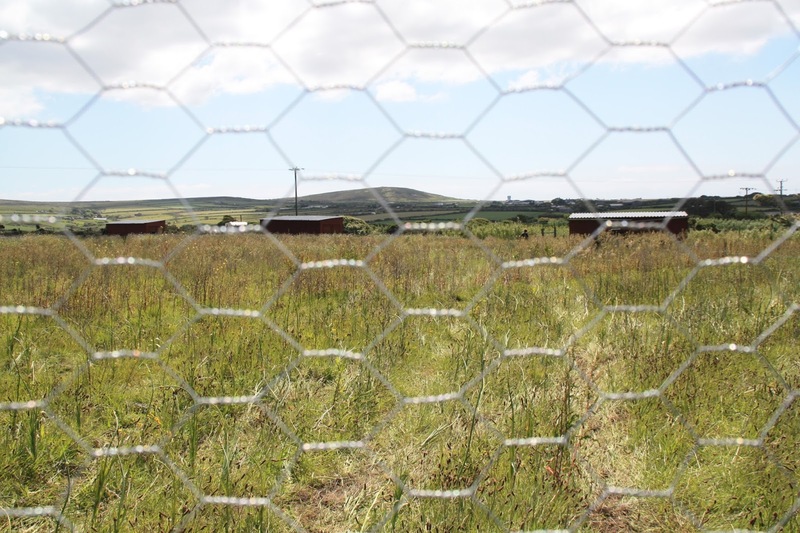 Shed 2 birds are released into their new field. 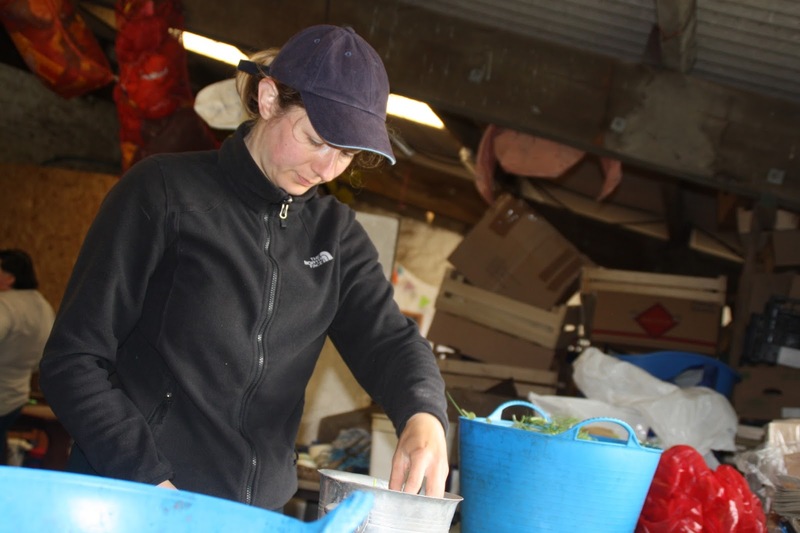 We would like to thank Inga, from Berlin via Cambridge, for her help on the farm for ten days, and wish her well on her new WWOOFing farm and back home. Big Open Farm Lunch Birthday. 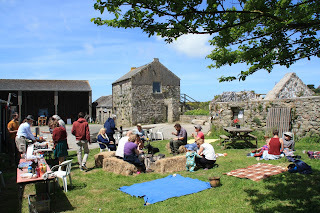 We had a lovely day on the farm yesterday, with about 40 people joining us for a communal picnic in the farmyard, with face-painting for the children (thanks to Inga), then a tour of the farm, followed by the cutting and eating of the birthday cake. 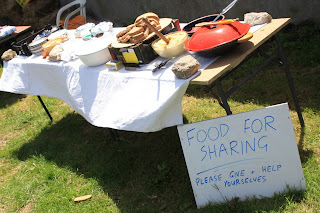 Communal food starting to pile up on the picnic table- many thanks to everyone who brought something along to share, it was a feast! 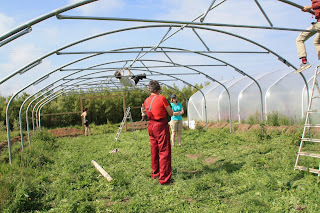 The farm tour reaches the chicken sheds, having taken in the polytunnels, market garden, cob build and bee hives on the way. Bosavern Community Farm's fifth birthday cake, made with the farm's own beetroot and eggs - we had to light and blow out the candles in the packing shed due to that omnipresent Penwith wind. Many thanks to everyone who helped to organise the day, and to tidy up afterwards, and everyone who came down to help us celebrate - we really enjoyed it. 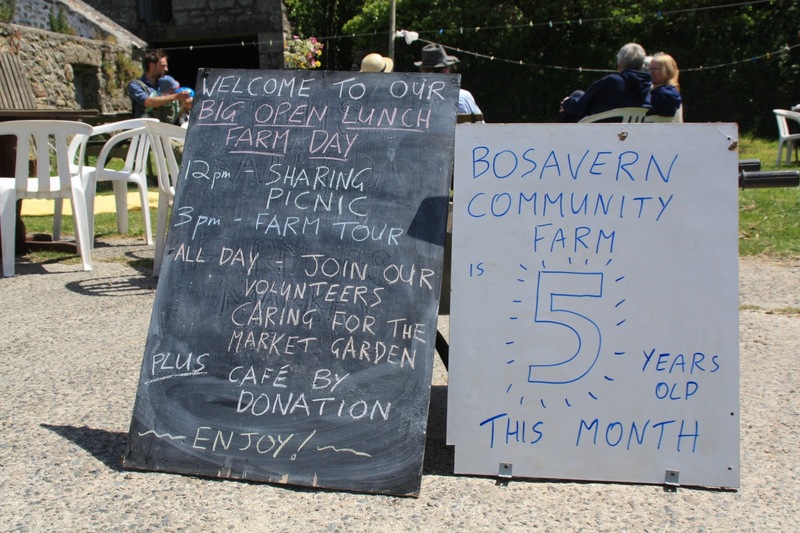 To celebrate Bosavern Community Farm's fifth birthday, this Sunday (7th June) we will be taking part in both Open Farm Sunday and the Big Lunch here on the farm. From midday onwards anybody is welcome to come along to the farm and join together for a communal picnic (please bring a dish and drinks to share). Our team of wwoofers will be weeding in the market garden and polytunnels, as well as collecting eggs, and anybody is welcome to join them for as little or as long as they want - please bring some clothes that you won't mind getting dirty. 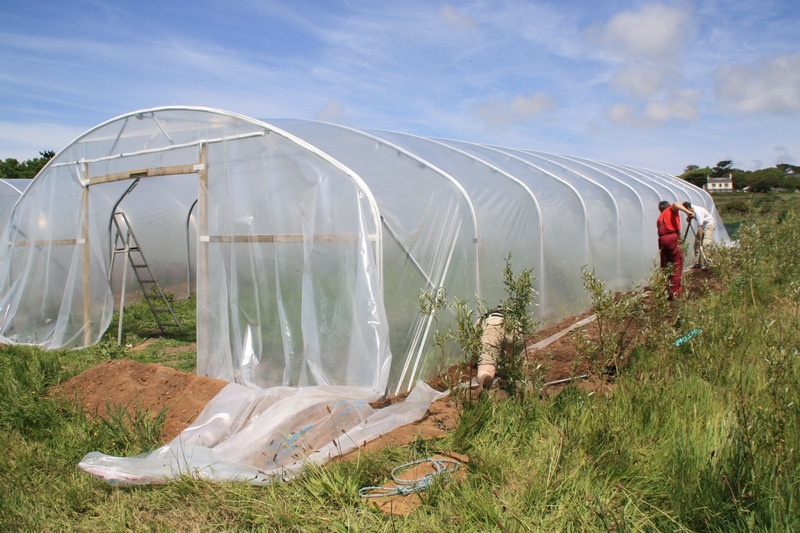 Then at 3 pm one of our growers will be leading a tour around the farm, and answering questions. All these events are free to attend. Our farm shop will be also open as normal from 11 am till 6 pm. 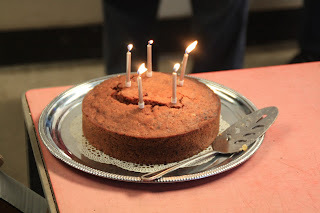 Come along and join the celebration! Leo, who has spent the past month living and working as a volunteer on the farm, left to head home to France today - many thanks Leo for all your hard work and commitment to the farm, and have a good summer back home. Leo (right) helping Anne (left) to erect the hoops of our latest polytunnel.